Was there a dinosaur-equivalent of Santa Claus living at the North Pole a 110 million years ago? The lack of fossil evidence suggests not…. But don’t worry because there were definitely dinosaurs living in the South Pole during the early cretaceous! And although they probably didn’t have beards and hand out presents, some of them were still quite cute. Leaellynasaura amicagraphica is probably the most famous South Polar dinosaur, it was a small (about 1 meter in length and 0.4 meters in height) ornithopod with big bulging eyes and a long, fluffy tail. Probably…. Unfortunately, due to the limited number of fossils of the animal that have been discovered so far, there isn’t a lot of definitive information I can present about Leaellynasaura. But in this blog I’ll give you the most up do date information on this little creature that is redefining the was we think about dinosaurs. Some paleontologists speculate that the animal may have had a fuzzy covering of down-like feathers and there is even a theory that they could wrap their super-long tails ( about 75% of their total body length) around themselves to stay warm like some sort of cartoon chipmunk, or an arctic fox, but all this is uncertain. We know for sure that some dinosaurs, like Guanlong, did have downy coats, and it makes sense that an animal living in such cold conditions as an antarctic winter would evolve some way to stay warm, but there is no sure evidence for fuzziness. One thing that does have some supporting evidence (kinda) is burrowing behavior. Fossil burrows have been found in the area where Leaellynasaura was discovered and some paleontologists theorize that our little dinosaur may have dug in to stay warm during the winter, but still there is no hard evidence. It has also been suggested that the dinosaur’s big eyes were adapted for the long, sun-less antarctic winters. The problem with that theory is that recent studies of the remains suggest that the only skull specimen of Leaellynasaura discovered may have belonged to a juvenile, and since juveniles often have proportionately large eyes, the night vision theory is losing traction. What is for sure is that the animal had to deal with pretty cool temperatures. All the fossil remains of Leaellynasaura amicagraphica that have been discovered so far come from Dinosaur Cove in Southern Australia, which in the early Cretaceous lay much further South than it does now, within the Antarctic Circle. The Earth was a warmer place in the Early Cretaceous, so there were no ice caps in the polar regions like there are today, but temperatures still got pretty low. The geology of the area shows evidence of icy winters. A snowy, wintry landscape is not the backdrop that most people would expect dinosaurs to fit into, but the terrible lizards have been surprising researchers a lot lately with their ability to adapt to any environment and most climates, much like modern mammals have. Leaellynasaura is proof that dinosaurs as a species were quite versatile. Fossil evidence is being studied more scrupulously than ever as paleontologist attempt to discover how these creatures were able to adapt and thrive so successfully for so long. We now know that many dinosaurs had feathers and it’s becoming a pretty sure thing that at least some of them were warm blooded, but the rock keeps it’s secrets close and their are still many unanswered questions. 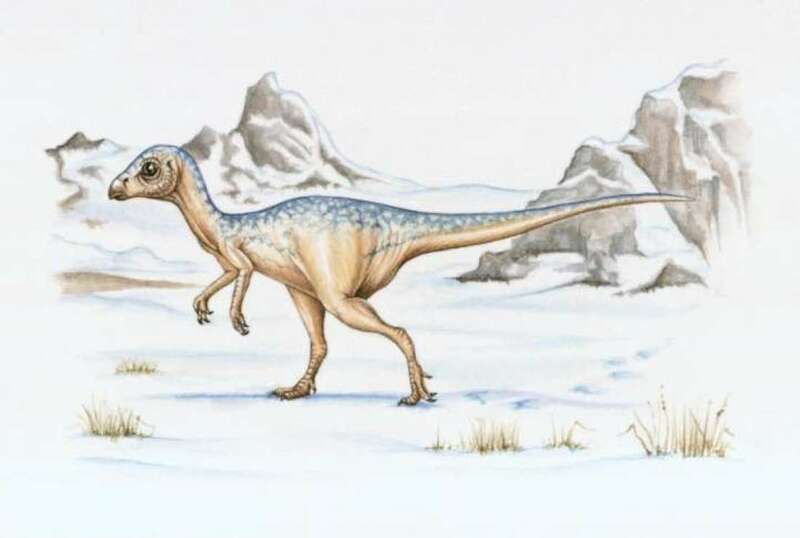 Dinosaurs are not the slow, cold-blooded lizards we originally though they were and the mystery of how Leaellynasaura was able to adapt to a seasonally freezing climate is just one more example of how we still have a lot to learn about the creatures who ruled earth before we did. Next Post What was the Christmas Star?